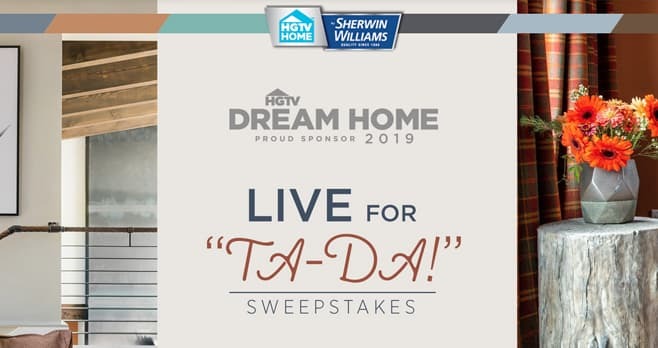 In celebration of the HGTV Dream Home 2019 Giveaway, Sherwin Williams brings you the HGTV Live For Ta-Da! Sweepstakes. Go to hgtv.com/livefortada and enter daily through February 18, 2019 for your chance to win a weekly prize of a $500 Lowe’s gift card. The HGTV Live For Ta-Da! Sweepstakes is open only to legal residents of the 50 United States and D.C. who are 21 years of age or older as of the Promotion start date. The Sweepstakes begins at 9:00 a.m. ET on December 28, 2018 until 5:00 p.m. ET on February 18, 2019. Limit of one (1) entry per eligible person, per day, during the Promotion Period. The grand prize consists of a $500 Lowe’s gift card. Visit www.hgtv.com/livefortada to enter and see Official Rules for details. Online Entry Form does not show up for Ta Da! Sweepstakes….also, after filling out entry form for HGTV Dream Home Sweepstakes, I get no reaction after “hitting” the ENTER block….What gives with this? I should think you folks would make it easier to enter, not more difficult…Entrants should not have to waste their time chasing down the entry forms….